This hypnosis recording will help to boost your self-esteem and give you the willpower to quit smoking once and for all. Are YOU Frustrated by the amount of times have you tried to quit? Are YOU Sick of feeling sick… worried about your health? Are YOU Tired of everyone giving you quit smoking tips but nothing changes? Now YOU can Enjoy being healthy and proud of your decision to quit smoking forever. Hypnotherapy is a proven technique for quitting smoking. 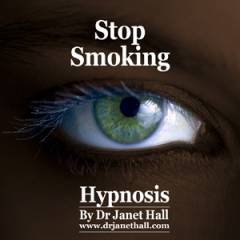 Dr Janet Hall’s Stop Smoking program supports you to stop smoking naturally. Empowered as you eliminate cravings and urges. Energised as you begin to feel the health benefits. In control of your choices and behaviours . Free to enjoy a healthy life. Imagine how you will feel when your smoking habit is a thing of the past! You will hear suggestions which will help you! Eliminate all triggers to smoke. No behaviour or activity need ever make you feel like a cigarette again. Find substitute behaviours to replace your smoking habit. The proven steps for making a smooth transition. Avoid cravings and withdrawal symptoms. Discover how to draw upon experience to instantly change your mindset. Tips and tricks for a smooth “detox” experience. An easy way to reduce stress whenever you need to. WHAT DOES QUITTING MEAN TO YOU? The best reason for quitting is to live a better life. You’ll have more energy, focus, and vitality. Food will taste better (but you won’t gain weight under our system). You’ll feel better about yourself, with more time and freedom and extra money in your pocket. Obviously it’s great that you’ll minimise your risk of cancer and disease – but the immediate benefits are what you’ll appreciate most. Smokers tend to have thinner skin and more wrinkles than non-smokers. This is because smoking reduces the blood supply to the skin and lowers levels of vitamin A. Quitting enables your skin to immediately begin to rejuvenate – meaning you’ll look younger, and feel younger too! “Stop Smoking With Hypnosis” right now! “How To Get Sensational Results With Dr Janet Hall’s Hypnosis”.